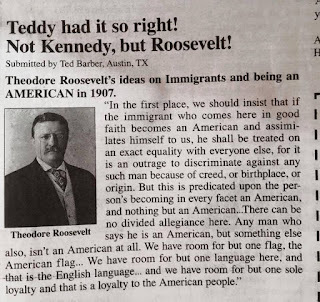 "In the first place, we should insist that if the immigrant who comes here in good faith becomes an American and assimilates himself to us, he shall be treated on an exact equality with everyone else, for it is an outrage to discriminate against any such man because of creed, or birthplace, or origin. But this is predicated upon the person's becoming in every facet an American, and nothing but an American ... There can be no divided allegiance here. Any man who says he is an American, but something else also, isn't an American at all. 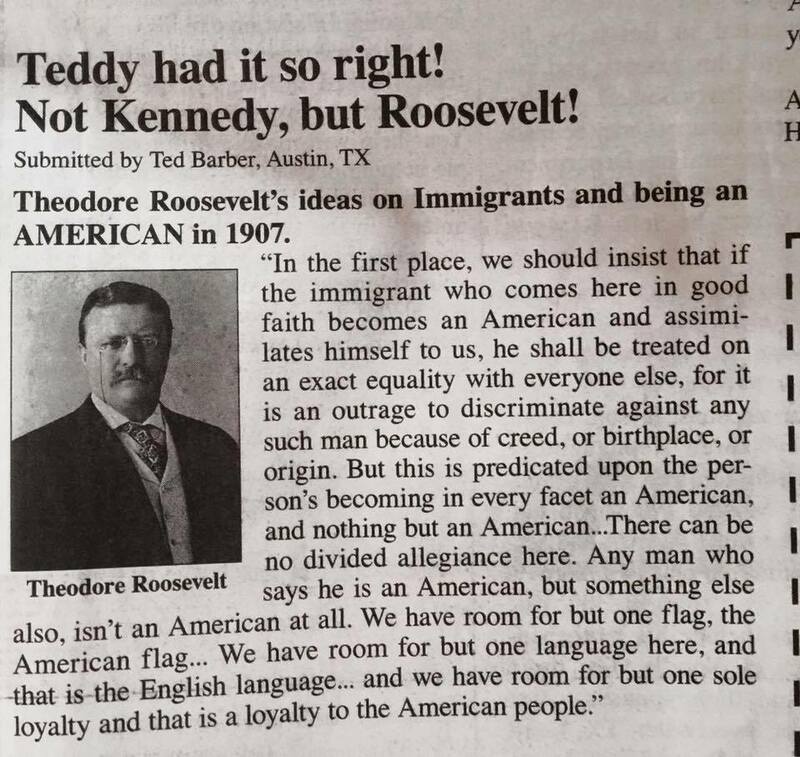 We have room for but one flag, the American flag ... We have room for but one language here, and that is the English language ... and we have room for but one sole loyalty and that is a loyalty to the American people." JP, speaking of Roosevelts, would you support legislation to get FDR off the dime and get Eisenhower back on? The one thing I'd add is that it appears that some creeds--radical versions of Islam and the like--simply cannot accommodate freedom. We don't want a religious test for citizenship, but at a certain point, we might need one. Something like that. It's a complex problem. The Ohio State Islamist came here as a kid (not sure of exact age). Sounds like his parents are OK.
Perhaps a good interim point would be to see if the mosques of the perpetrators have anything to do with it--and then let the victims know the information. Perhaps the bar can help solve a lot of the problems. I think this new anti-immigrant mood can be blamed on large part on PBS and the sad change of Mr. Rogers. He used to sing "It's a beautiful day in the neighborhood," which was inclusive of all. Lately he has changed his tune and has started singing "It's a beautiful day in THIS neighborhood." I am very disappointed in this sudden chame. It's a very in your face attidutde. He's may as well say, "It's a nice day in MY suburban, Protestant, white neighborhood."